Robert Alexander Mundell, CC (born October 24, 1932) is a Canadian economist. Currently, he is a professor of economics at Columbia University and the Chinese University of Hong Kong. He received the Nobel Memorial Prize in Economic Sciences in 1999 for his pioneering work in monetary dynamics and optimum currency areas. Mundell is known as the "father" of the euro, as he laid the groundwork for its introduction through this work and helped to start the movement known as supply-side economics. Mundell is also known for the Mundell–Fleming model and Mundell–Tobin effect. Mundell was born in Kingston, Ontario, Canada. He earned his BA in Economics at the University of British Columbia in Vancouver, Canada, and his MA at the University of Washington in Seattle. After studying at the University of British Columbia and at The London School of Economics in 1956, he attended the Massachusetts Institute of Technology (MIT), where he obtained his PhD in Economics in 1956. In 2006 Mundell earned an honorary Doctor of Laws degree from the University of Waterloo in Canada. He was Professor of Economics and Editor of the Journal of Political Economy at the University of Chicago from 1965 to 1972, Chairman of the Department of Economics at the University of Waterloo 1972 to 1974 and since 1974 he has been Professor of Economics at Columbia University. He also held the post of Repap Professor of Economics at McGill University. Mundell was awarded the Guggenheim Fellowship in 1971 and the Nobel Memorial Prize in Economics in 1999. In 2002 he was made a Companion of the Order of Canada. In 1992, Mundell received the Docteur Honoris Causa from the University of Paris. Mundell's honorary professorships and fellowships were from Brookings Institution, the University of Chicago, the University of Southern California, McGill University, the University of Pennsylvania, the Bologna Center and Renmin University of China. He became a Fellow of the American Academy of Arts and Sciences in 1998. In June 2005 he was awarded the Global Economics Prize World Economics Institute in Kiel, Germany and in September 2005 he was made a Cavaliere di Gran Croce del Reale Ordine del Merito sotto il Titolo di San Ludovico by Principe Don Carlo Ugo di Borbone Parma. The Mundell International University of Entrepreneurship in the Zhongguancun district of Beijing, People's Republic of China is named in his honor. Mundell is best known in politics for his support of tax cuts and supply-side economics; however, in economics it is for his work on currency areas and international exchange rates that he was awarded the Sveriges Riksbank Prize in Economic Sciences in Memory of Alfred Nobel by the Bank of Sweden (Sveriges Riksbank). Nevertheless, supply-side economics featured prominently in his Bank of Sweden prize speech. In the 1960s, Canada, of which Mundell is a native, floated its exchange: this caused Mundell to begin investigating the results of floating exchange rates, a phenomenon not widely seen since the 1930s "Stockholm School" successfully lobbied Sweden to leave the gold standard. In 1962, along with Marcus Fleming, he co-authored the Mundell–Fleming model of exchange rates, and noted that it was impossible to have domestic autonomy, fixed exchange rates, and free capital flows: no more than two of those objectives could be met. The model is, in effect, an extension of the IS/LM model applied to currency rates. Discipline under the Bretton Woods system was more due to the US Federal Reserve than to the discipline of gold. Demand side fiscal policy would be ineffective in restraining central banks under a floating exchange rate system. Single currency zones relied, therefore, on similar levels of price stability, where a single monetary policy would suffice for all. 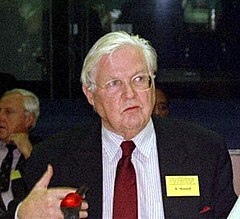 His analysis led to his conclusion that it was a disagreement between Europe and the United States over the rate of inflation, partially to finance the Vietnam War, and that Bretton Woods disintegrated because of the undervaluing of gold and the consequent monetary discipline breakdown. There is a famous point/counterpoint over this issue between Mundell and Milton Friedman. This work later led to the creation of the euro and his prediction that leaving the Bretton Woods system would lead to "stagflation" so long as highly progressive income tax rates applied. In 1974, he advocated a drastic tax reduction and a flattening of income tax rates. Mundell, though lionized by some conservatives, has many of his harshest critics from the right: he denies the need for a fixed gold based currency or currency board (he still often recommends this as a policy in hyperinflationary environments) and he is both a fiscal and balance of payments deficit hawk. He is well known for stating that in a floating exchange rate system, expansion of the money supply can come about only by a positive balance of payments. In 2000, he predicted that before 2010, the euro zone would expand to cover 50 countries, while the dollar would spread throughout Latin America, and much of Asia would look towards the yen. Such predictions have proved highly inaccurate. Mundell won the Nobel Memorial Prize in Economic Science in 1999 and gave as his prize lecture a speech titled "A Reconsideration of the Twentieth Century". According to the Nobel Prize Committee, he got the honor for "his analysis of monetary and fiscal policy under different exchange rate regimes and his analysis of optimum currency areas". The first third of the century, from its beginning to the Great Depression of the 1930s, economics was dominated by the confrontation of the Federal Reserve System with the gold standard. The second third of the century was from World War II to 1973, when the international monetary system was dominated by fixing the price of gold with the US dollar. The last third of the century started with the destruction of the old monetary system due to the problem of inflation. With the destruction of the old monetary system, a new international monetary system was finally founded. Controlling inflation by each country became a main topic during this era. Mundell has appeared on CBS's Late Show with David Letterman. His first appearance was on October 17, 2002 where he gave The Top 10 List on "Ways My Life has Changed Since Winning the Nobel Prize." In March 2004 he told "You might be a redneck" jokes followed in May 2004 with "Yo Mama" jokes. In September 2004 he appeared again, this time to read excerpts from Paris Hilton's memoir at random moments throughout the show. In November 2005 he told a series of Rodney Dangerfield's jokes. On February 7, 2006 he read Grammy Award nominated song lyrics, the night before CBS aired the 48th Grammy Awards. Mundell also appeared on Bloomberg Television many times, mainly speaking on the euro related-topics and other european financial issues. Mundell has also appeared on China Central Television's popular Lecture Room series. Professor Mundell was also a special guest making the ceremonial first move in Game Five of the 2010 World Chess Championship between Viswanathan Anand and Veselin Topalov. Mundell started the Pearl Spring Chess Tournament, a double round robin tournament with six players. The first tournament in 2008 was won by the Bulgarian, Veselin Topalov. The next two: 2009–2010 was won by the Norwegian, Magnus Carlsen. Redundancy problem - suggested by Robert Mundell. ^ Robert A. Mundell – Biographical. NobelPrize.org. Nobel Media AB 2018. Sat. 1 Dec 2018. ^ Essays in the theory of international capital movements page 3. Retrieved September 12, 2016. ^ Warsh, David (November 1, 2009). "What The Woman Lived". Economic Principals. Retrieved October 17, 2016. ^ "The Sveriges Riksbank Prize in Economic Sciences in Memory of Alfred Nobel 1999". NobelPrize.org. Retrieved December 1, 2018. ^ "Economist Mundell: Odds of Greek Euro Exit 25%". WSJ. Retrieved December 1, 2018. ^ "Robert Mundell – Nobel Prize Winners – Key facts – About LSE – Home". .lse.ac.uk. March 13, 2009. Retrieved January 1, 2012. ^ "Biography of Robert Mundell" (PDF). The Hong Kong Polytechnic University. Archived from the original (PDF) on April 2, 2012. Retrieved July 6, 2012. ^ a b "Robert A. Mundell – Biography". Nobelprize.org. Retrieved January 1, 2012. ^ a b "Biography | The Works of Robert Mundell". Robertmundell.net. Retrieved January 1, 2012. ^ "Mundell-Friedman debate" (PDF). Archived from the original (PDF) on January 18, 2012. Retrieved January 1, 2012. ^ Mark Milner and Charlotte Denny (January 14, 2000). "The new endangered species | Business". London: The Guardian. Retrieved January 1, 2012. ^ "Robert Mundell on Pimm Fox's Bloomberg Television". The Works of Robert Mundell. May 26, 2011. Retrieved December 1, 2018. Mundell, Robert A (1968). Man and economics. New York: McGraw-Hill. Mundell, Robert A (1971). Monetary theory; inflation, interest, and growth in the world economy. Pacific Palisades, Calif.: Goodyear Pub. Co. ISBN 0876205864. Conference on the New International Monetary System; Mundell, Robert A; Polak, J. J; Fleming, J. Marcus; International Monetary Fund; Columbia University, eds. (1977). The new international monetary system. New York: Columbia University Press. ISBN 0231043686. Mundell, Robert A (1968). International economics. New York: Macmillan. his analysis of monetary and fiscal policy under different exchange rate regimes and his analysis of optimum currency areas. "Robert A. Mundell (1932– )". The Concise Encyclopedia of Economics. Library of Economics and Liberty (2nd ed.). Liberty Fund. 2008.